Displaying Collections: Top Tips! 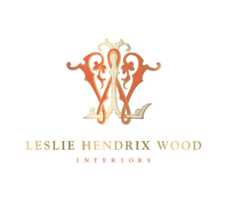 Learn Display Secrets top Interior Designers Use! Displaying collections artfully is a challenge professional interior designers are often called in to answer. Especially if you consider that collecting is the number 1 hobby in the United States. Learn our top tips for arranging your collections. 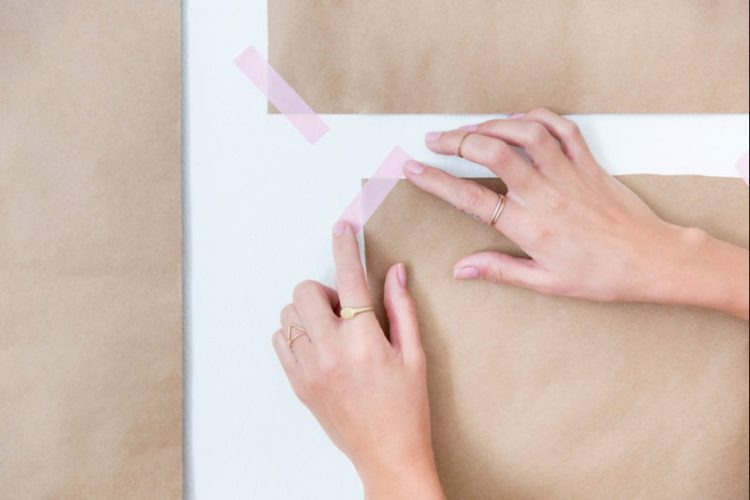 It’s well known that measuring and cutting out a paper template for each item in your collection, and taping it on your wall, is a successful method for arranging your collection into a pleasing composition. 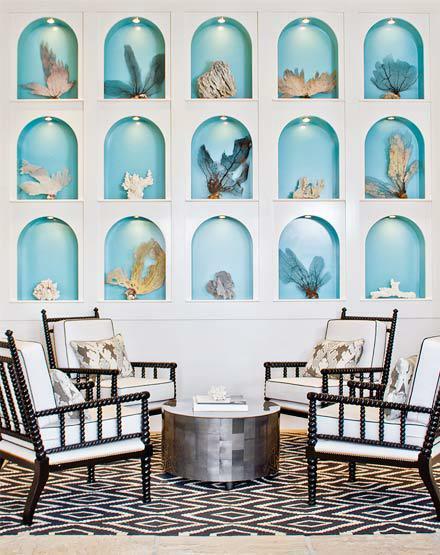 This is especially helpful when the items in your collection are as disparate as the sea fans and corals in the beautiful opening image of this display wall designed by Allison Elebash for the Christophe Harbour Beach Club in St. Kitts. However, what is not often done is the next step: taking a picture of the item and taping that to the front of the paper template. Being able to pin each paper template up on your wall before you begin, with a picture of the item on the front of it, will help you adjust your display plan according to not only the item’s shape, but by its color and visual weight as compared to the other items it will be displayed with, and this will be an invaluable help to you as you organize and visualize your collection’s final arrangement. If this prospect seems daunting, or if you’re not able to harmonize scale, proportion, color and visual weight, by sight, please consider hiring a professional interior designer to assist you in creating a beautiful and unique way to display your collection. 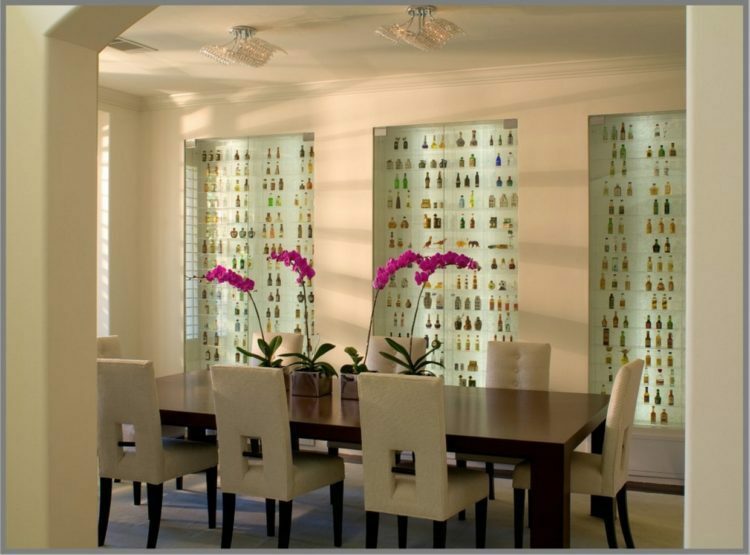 If your collection consists of a lot of *smalls*, as in the miniature liquor bottle collection below, consider how you can make your collection the focal point of your room through the creation of a unique architectural envelope. 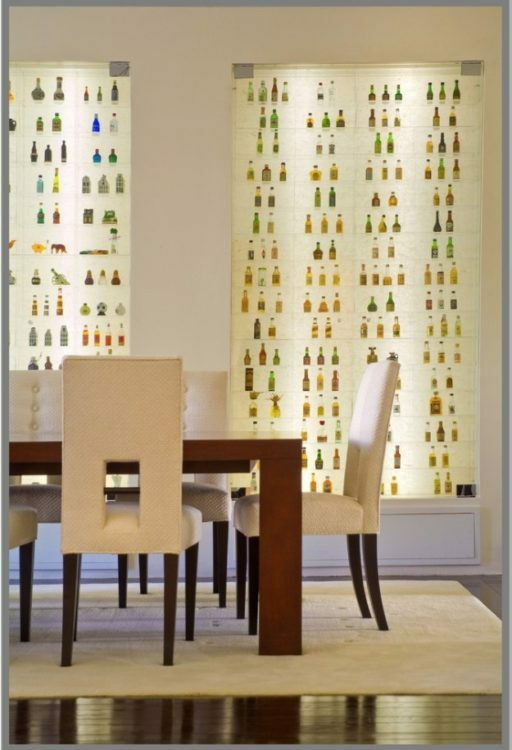 In this example, interior designer Tracy Murdock built out the wall in her client’s dining room to form niches where special fluorescent lighting tubes were installed behind each section. She then lined the acrylic back wall with rice paper. Acrylic “grids” were installed – where there is a box for each bottle – giving the effect that each is floating. Finally glass doors were installed to keep out the dust…but also to insure the safety of the collection. We think she succeeded beautifully in taking hundreds of small items and making them into a museum quality focal point that must be a wonderful conversation starter for her clients when they are entertaining. Consider how you can use lighting to highlight the colors, forms and shapes of your collection, especially if the items you collect are not brightly colored. 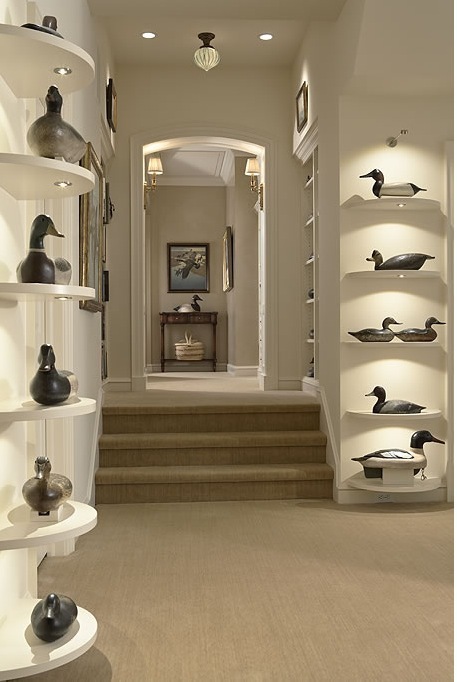 In this collection of duck decoys below, whose hand painted colors are subtle unless lighted properly, interior designer Maureen Haggarty did an outstanding job of this. 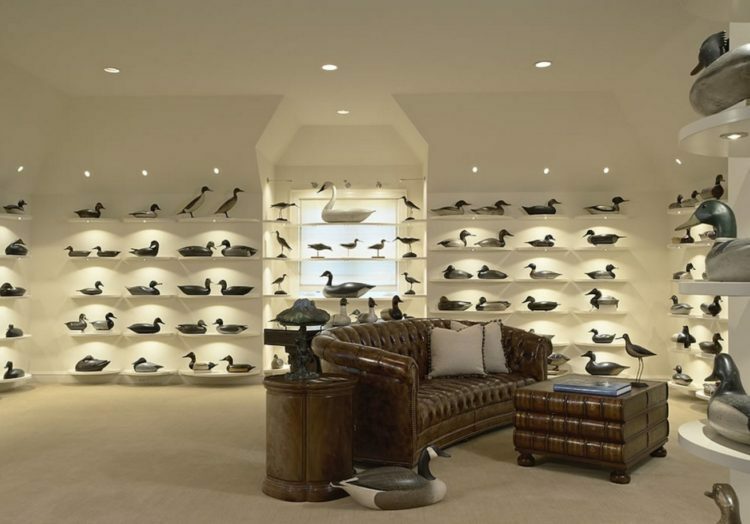 Through careful lighting choices, the graphic forms of her client’s collection stand out and she has created a gorgeous focal point that allows each decoy to shine on its own. As you can see, her clients are serious collectors and through her lighting scheme, she has created an elegant, unique and beautiful room for them, undoubtedly full of memories and stories that her clients enjoy sharing with their family and friends. If your collection is full of widely disparate shapes and elements, but with a common theme, unify the collection by placing each item in clear, beautiful containers, which are, themselves, unified in size and shape. 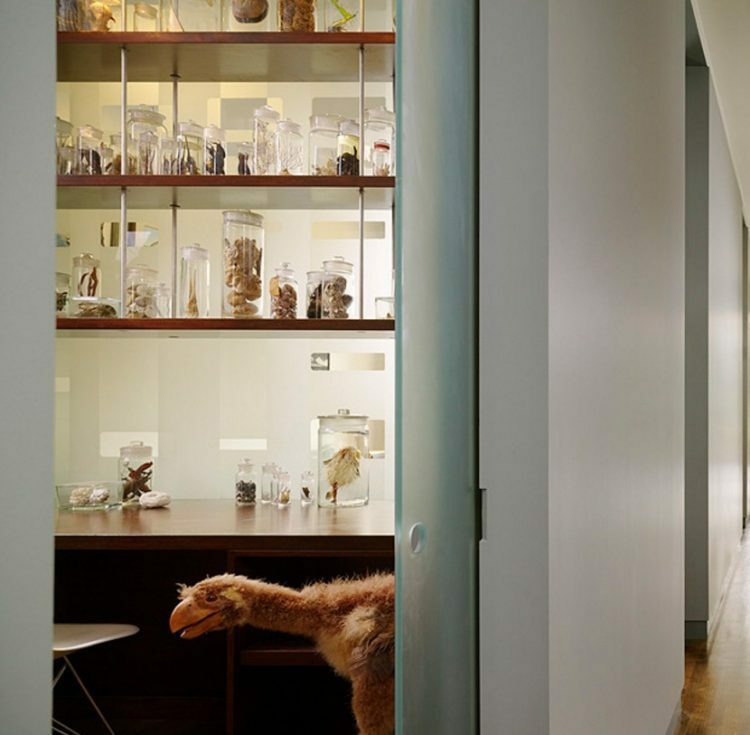 In the example above, architect Jack Schwartz‘s client had a modern-day cabinet of curiosities, brimming with different sized jars filled with preserved aquatic body parts and specimens. 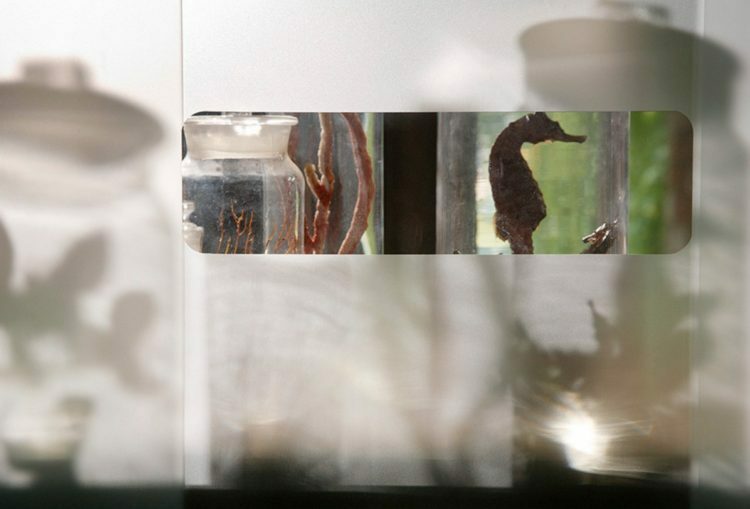 He created unification of the collection through first choosing a single style of clear glass container, in varying sizes, and combining that with a single clear acrylic box style, also in different sizes. 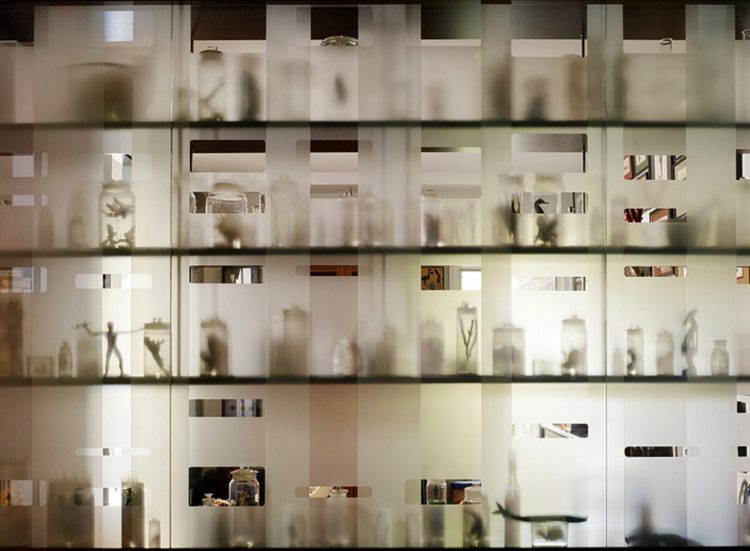 Then, he designed a partially translucent glass wall (derived from the genetic code of a Harbor Seal) and also a shelving system so the collection now becomes the focal point of his client’s home, seen from almost every vantage point. 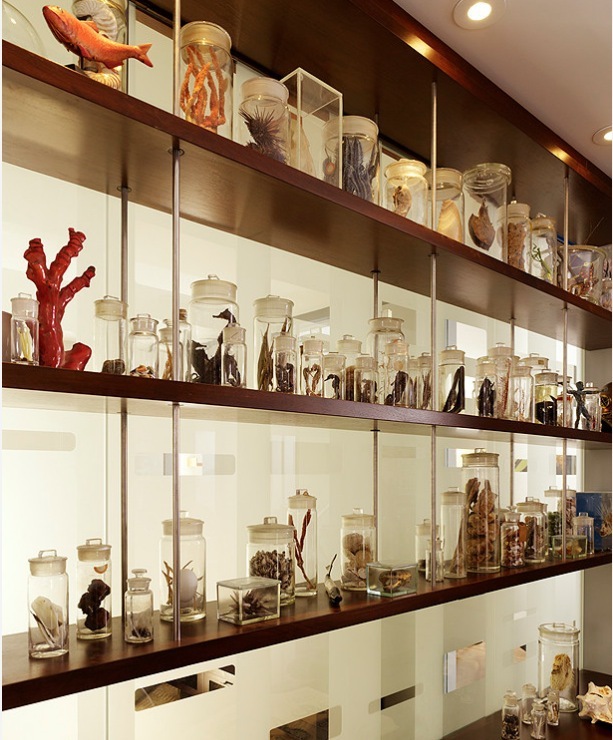 Readers, we hope you’ve enjoyed this post on displaying collections. What questions do you have about displaying your own collections? Please let us know in the comments and we will do our best to help you! As always, thank you for reading Hadley Court, we appreciate YOU. « Fall Outdoor Designs from Traditional Home, Barclay Butera and More!